An international team of astronomers has located a massive, hot young galaxy cluster – the largest ever seen in the distant universe. The finding was announced Tuesday at the 219th meeting of the American Astronomical Society in Austin, Texas. 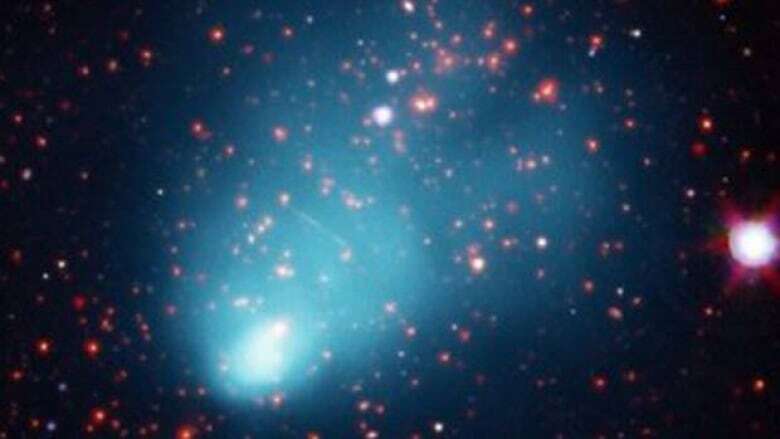 Nicknamed El Gordo, which means "fat one" in Spanish, the new discovery consists of two separate galaxy subclusters colliding at several million kilometres per hour, and is so far away that its light has travelled for seven billion years to reach the Earth. Galaxy clusters are the largest objects in the universe held together by gravity. They form when smaller groups of galaxies merge together. The process depends on the amount of dark matter and dark energy in the universe at that time. Studying clusters can shed some light on these mysterious components of the cosmos. "Gigantic galaxy clusters like this are just what we were aiming to find," said team member Jack Hughes, also of Rutgers. "We want to see if we can understand how these extreme objects form using the best models of cosmology that are currently available." Big Bang, the extremely hot and dense origin of the Universe about 13.7 billion years ago, can be used to explain El Gordo's formation, though a cluster of this size and distance is extremely rare. El Gordo was found using NASA's Chandra X-ray Observatory and the National Science Foundation-funded Atacama Cosmology Telescope (ACT) in Chile. A team of astronomers from Chile and Rutgers detected a distortion of the cosmic microwave background radiation. This faint glow is the remnant of the first light from the big bang. The radiation left over from the big bang interacts with electrons in the hot gas in galaxy clusters, distorting the appearance of the background glow seen from Earth. El Gordo is akin to the well-known object called the Bullet Cluster, which is located almost four billion light years closer to Earth. Like the Bullet Cluster, there is evidence that normal matter, mainly composed of hot, X-ray bright gas, has been wrenched apart from the dark matter in El Gordo. The hot gas in each cluster was slowed down by the collision, but the dark matter was not. "This is the first time we've found a system like the Bullet Cluster at such a large distance," said Cristobal Sifon of Pontificia Universidad de Catolica de Chile in Santiago. "It's like the expression says: if you want to understand where you're going, you have to know where you've been."